Once upon a time, there was a wild horse living a carefree life. He freely roamed the vast grasslands and enjoyed Nature's fresh gifts. But one day, the hunters came. The young stallion was captured and sold to a stable. The stable masters did everything they could to tame the stubborn horse. They chained and starved him for days. They beat him numerous times with an iron whip. Yet, the horse refused to give in. The brutal beatings left countless marks on the stallion's body. Each of the marks was a painful reminder of the brutality, emboldening the horse's desire for revenge. One day, the stallion was finally tamed to the surprise of the stable masters. They were ecstatic because the horse can finally be sold for a profit. Little that they knew, this was a ruse in the horse's plot for revenge. Once he will be handed to the new owner and that owner would mount him for the first time, the stallion planned to push him off the mount with a violent shake and stomp on him mercilessly with his iron-clad foot. The stallion's new owner was an old general, who treated the horse well. He was given abundant space to roam and the freshest grass to eat. Every time the general rode him in the grand parade, he was the envy of his peers. Amid his wonderful new life, the horse suddenly forgot his plan for revenge. More precisely, he chose to forget it. The stallion's happiness did not last long however. The general fell ill one day and passed away peacefully in his sleep. The horse was returned to his original stable, where his hellish life resumed. He was once again bruised and beaten. His body received many new marks, in addition to the old ones. The stallion was later sold to a trainer, who converted him into a racehorse. What a racehorse he was! His speed was unparalleled; his endurance was unrivaled. In his first race, he crushed his opponents. In his second race, he was the runaway winner. The stallion became an overnight sensation. When it was time for the year's biggest derby, the stallion was the oddsmakers’ favorite. Despite the low payout, people put their bets on the champion horse. It was not about money. They just wanted to support their favorite stallion. Unfortunately, the horse's trainer had other plans for him. He wanted his stallion to lose and will do anything to make it happen. On the night before the race, the trainer put arsenic in the horse's feed. Minutes before the big derby, the stallion started to feel the arsenic effects. His eyes turned red and his limbs were in great pains. But the proud horse refused to abandon the race. Halfway into the derby, the stallion was once again leading the field. His trainer was surprised by his persistence; he made a quick signal to his jockey to stop the horse at all costs. The jockey did everything he could to cease the horse's advance. He pulled hard on the reins in an attempt to stop the horse. He whipped the horse's head repeatedly to coerce him into submission. But nothing worked. The stallion was still moving forward, to the astonishment of the jockey. He did not win the race in the end, however, losing out in a photo finish. One day, the horse overheard the stable master's plan to kill him and sell his meat to a Japanese trader. Although he did not understand a single word that was said, he could sense the malicious intent. He knew he must escape the stable somehow. The next day was a national holiday; many stable workers did not show up for work. The stallion took advantage of the opportunity and made his escape. He jumped over the gate, knocked the greedy stable master down with a high kick and made a dash for his life. When the other stable masters learned of his escape, they dispatched a group of skilled hunters to chase him down. When the hunters were within distance of the horse, they fired several shots at him. The stallion was hit at least three times; his battered body was covered with blood. With one last burst of energy, however, the wounded horse managed to lose his chasers. 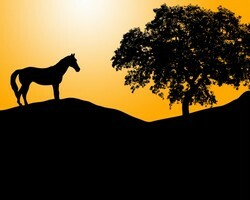 After a long journey, the stallion finally returned to the great grasslands where he was born. Exhausted, he collapsed on the greenish field. At that moment, he let out a joyous whinny. He was home at last.